Purpose To assess the potential of ready-made (spherical) spectacles (RMS) in meeting the need for refractive correction in visually impaired children in China. Methods Eligible children aged 5–17 years were identified from the three study sites in China. Distance visual acuity was measured with a retroilluminated logarithm of the minimum angle of resolution chart with tumbling E optotypes. Cycloplegic autorefraction was performed on all children using a handheld autorefractor. If uncorrected visual acuity (UCVA) was ≤20/40 in either eye, best corrected visual acuity was measured with subjective refractive error. Results A total of 13 702 children were enumerated from the three studies, with 12 334 (90.0%) having both reliable visual acuity measurements and successful cycloplegia. Among the 12 334 study children, the prevalence of UCVA ≤20/40 in the better seeing eye was 16.4% (95% CI 15.0% to 17.8%), with 91.1% (1843) of these improving by ≥3 lines of visual acuity with refractive correction. Prevalence was 12.7% (95% CI 11.5% to 13.9%) for UCVA <20/50 with 97.4% (1521) improving by ≥3 lines, and 9.38% (95% CI 8.39% to 19.4%) for UCVA ≤20/63 with 98.4% (1138) improving by ≥3 lines. Depending on the severity of visual impairment, 62.8%–64.0% of children could be accommodated with RMS if not correcting for astigmatism of ≤0.75 dioptres and anisometropia of ≤0.50 spherical equivalent dioptres. Approximately 87% of children could be accommodated with RMS if astigmatism and anisometropia limits were increased to ≤1.25 and ≤1.50 dioptres, respectively. Conclusions RMS could substantially alleviate visual morbidity in two-thirds or more of visually impaired schoolchildren in China. This cost-effective approach to refractive correction might also be useful in low/middle-income countries with poor access to optometric services. Refractive error correction has been a priority for the WHO’s Vision 2020: The Right to Sight global campaign to eliminate global visual impairment and blindness.6 Although the treatment of URE with spectacles is straightforward, high costs and poor access to refractive services limit universal correction. School-based screenings and spectacles distribution programmes have become increasingly common in recent years,7 some of which have used ready-made spectacles (RMS) that provide equal spherical correction in each eye8–10 and can be made in bulk at low costs. In practice, the main limitations excluding RMS as a suitable option for refraction correction are the extents of astigmatism and anisometropia. Studies have postulated that RMS could meet the needs of 66%–89% of adults requiring refractive correction11–13 with acceptability in visual function, patient satisfaction and continued use.9 10 However, little information is available regarding the potential percentage of children with refractive error who could benefit from RMS. Among the studies that have been performed examining RMS in children, the criteria for suitability of RMS have varied, ranging from astigmatism less than 0.75 to 1.25 dioptres (D) and anisometropia less than 0.50 to 2.00 D.9–14 The extent to which anisometropia and astigmatism are tolerated also differed considerably among individuals.15 To date, there are no reliable estimates of the acceptability of RMS in meeting the need for refractive spectacles under different levels of anisometropia and astigmatism. This article used cross-sectional data from three study sites in China to examine the suitability of RMS for meeting the need for spectacles in visually impaired children aged 5–17 years. The RESC and Yangxi County studies adhered to the tenets of the Declaration of Helsinki. A guardian for each child was informed of the study details and asked to provide signed, informed consent. Distance visual acuity was measured at 4 m using a retroilluminated logarithm of the minimum angle of resolution chart with five tumbling E optotypes on each line (Precision Vision, La Salle, Illinois, USA), ranging from −0.30 to 1.00. Cycloplegia was induced with two drops of 1% cyclopentolate, administered 5 min apart, with a third drop administered after 20 min. Cycloplegia and pupil dilation were evaluated after an additional 15 min. Cycloplegia was recorded as being present if pupils were dilated over 6 mm or light reflex was absent. Cycloplegic autorefraction was performed on all children using a handheld autorefractor (ARK-30, Nidek). If uncorrected visual acuity (UCVA) was ≤20/40 in either eye, best corrected visual acuity (BCVA) was measured with subjective refraction. The prevalence of uncorrected visual impairment was calculated using three levels of severity in the better seeing eye: ≤20/40, ≤20/50 and ≤20/63. The association of age, gender and study site with each of the three levels of vision impairment was investigated with multiple logistic regression. The need for corrective spectacles was separately defined as either ≥2 or ≥3 lines of visual acuity improvement in the better seeing eye with BCVA compared with that in the better seeing eye with UCVA. If both eyes had the same BCVA, the eye with the smaller magnitude of spherical equivalent refractive error was considered as the better seeing eye. The percentage of visually impaired children needing spectacles was calculated under six screening scenarios: (1) UCVA ≤20/40 and ≥2 lines of improvement; (2) UCVA ≤20/40 and ≥3 lines of improvement; (3) UCVA ≤20/50 and ≥2 lines of improvement; (4) UCVA ≤20/50 and ≥3 lines of improvement; (5) UCVA ≤20/63 and ≥2 lines of improvement; (6) UCVA ≤20/63 and ≥3 lines of improvement. The potential of RMS in meeting the need for corrective spectacles within each of these six screening scenarios was investigated for a range of specified limits on the acceptability for uncorrected astigmatism and anisometropia. Limits on uncorrected astigmatism were analysed for cylinder values of ≤0.75, ≤1.00 and ≤1.50 D, and anisometropia was analysed for spherical difference of ≤0.50, ≤1.00 and ≤1.50 D. The percentage of children meeting these criteria for each screening scenario was calculated as the ratio of the number of children within acceptable limits to the total number of visually impaired children needing refractive correction. A total of 13 702 children were enumerated (Shunyi: 6134, Guangzhou: 5053 and Yangxi: 2515), with 12 641 (92.3%) having reliable visual acuity measurements in one or both eyes and an ocular examination. Successful cycloplegic refraction in both eyes was not available for 307 of the examined children, leaving a total of 12 334 (90.0%) children in the study population. Demographic characteristics of the study population within each of the three study sites are shown in online supplementary table 1. Shunyi and Guangzhou, with children aged 5–15 years, comprised 47.5% and 35.0% of the total study sample, respectively. Yangxi, with children aged 13–17 years, comprised 17.5% of the study sample. The prevalence of UCVA in the better seeing eye by age across all three sites is shown in table 1. The overall prevalence for the three vision impairment levels, ≤20/40, ≤20/50 and ≤20/63, was 16.4% (95% CI 15.0% to 17.8%), 12.7% (95% CI 11.5% to 13.9%) and 9.38% (95% CI 8.39% to 10.4%), respectively. In multiple logistic regression modelling with age, gender and study site as covariates, the prevalence of vision impairment was lower in Shunyi compared with Yangxi (the reference site), with statistically significant ORs of 0.62 (95% CI 0.54 to 0.73, p<0.001) for UCVA ≤20/40 and 0.73 (95% CI 0.62 to 0.86, p<0.001) for UCVA ≤20/50, but not statistically significant for UCVA ≤20/63 (OR: 0.84, 95% CI 0.69 to 1.01, p=0.070). The prevalence of vision impairment in urban Guangzhou was likewise significantly higher compared with Yangxi, with ORs of 2.13 (95% CI 1.85 to 2.46, p<0.001), 2.35 (95% CI 2.01 to 2.74, p<0.001) and 2.52 (95% CI 2.13 to 3.00, p<0.001), respectively, for UCVA ≤20/40, ≤20/50 and ≤20/63. Vision impairment was significantly more prevalent among older subjects with ORs of 1.32 (95% CI 1.29 to 1.35, p<0.001) for UCVA <20/40, 1.40 (95% CI 1.37 to 1.45, p<0.001) for UCVA <20/50 and 1.46 (95% CI 1.42 to 1.51, p<0.001) for UCVA <20/63, and among women with ORs of 1.79 (95% CI 1.61 to 1.98, p<0.001), 1.91 (95% CI 1.70 to 2.14, p<0.001) and 1.90 (95% CI 1.67 to 2.17, p<0.001), respectively, for UCVA ≤20/40, ≤20/50 and ≤20/63. The need for corrective spectacles in each of the six screening scenarios—based on ≥2 or ≥3 lines of improvement within each of three levels of visual impairment—is shown in table 2. Across all three levels of visual impairment, the need for refractive correction exceeded 90% by ages 7–9 years when defined as ≥2 lines of improvement, and by ages 10–12 years when defined as ≥3 lines of improvement. For children aged 5–6 years, the need for refractive correction was most notable for those with UCVA ≤20/50 and ≤20/63. 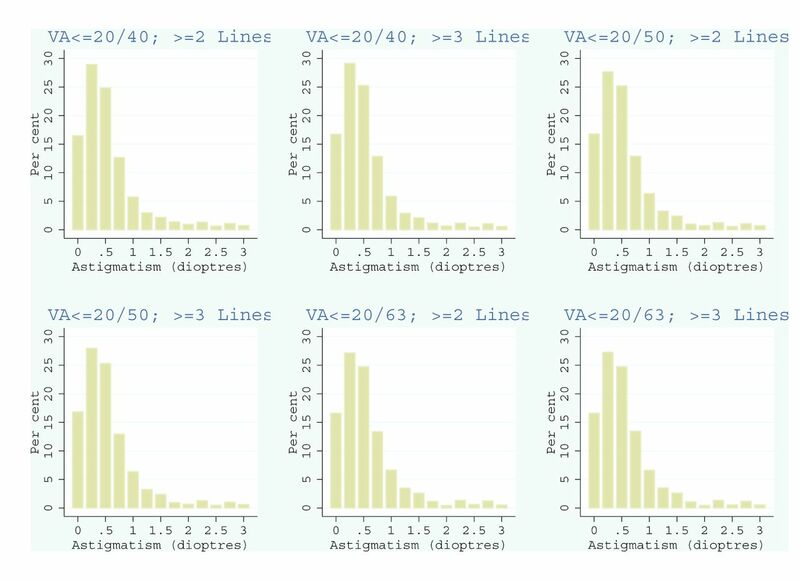 The distributions of astigmatism with cycloplegic autorefraction in the best corrected, better seeing eye among children with UCVA ≤20/40, ≤20/50 or ≤20/63 improving by ≥2 or ≥3 lines with refractive correction are shown in figure 1. The astigmatism median was 0.50 D for all six scenarios, with means and SDs ranging from 0.645±0.815 to 0.686±0.871 D (online supplementary table 2). 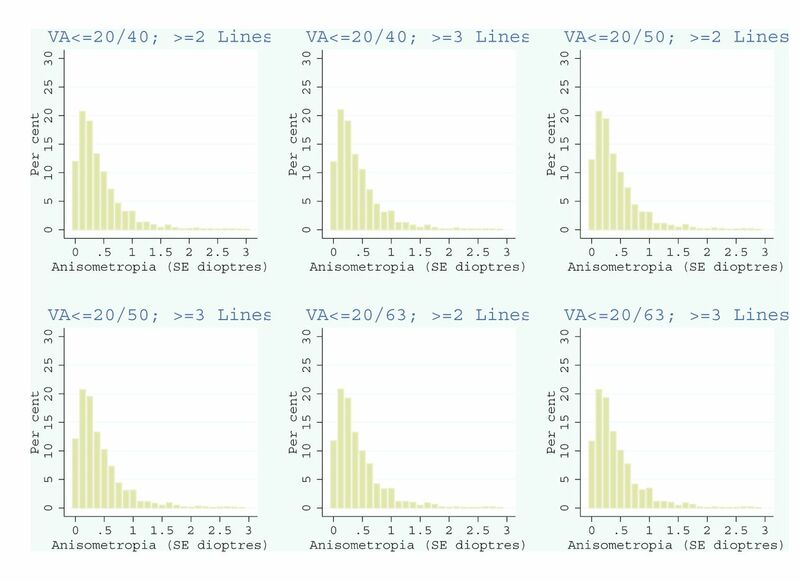 The distributions of anisometropia, shown in figure 2, had a median value of 0.25 D for all six scenarios and means and SDs between 0.418±0.571 and 0.466±0.694 D.
The distributions of astigmatism measured with cycloplegic autorefraction in visually impaired children improving by ≥2 or ≥3 lines with refractive correction in the best corrected, better seeing eye. VA, visual acuity. The distributions of spherical equivalent anisometropia measured with cycloplegic autorefraction in visually impaired children improving by ≥2 or ≥3 lines with refractive correction in the best corrected, better seeing eye. SE, spherical equivalent; VA, visual acuity. The potential of RMS to treat visual impairment is dependent on the maximum amount of astigmatism and anisometropia that can be ignored with a single spherical-only correction. Percentages of astigmatism and anisometropia within specified limits for each of the six screening scenarios are shown in table 3. Children with astigmatism ≤0.75 D and with anisometropia ≤0.50 D represent reasonable candidates for RMS based on WHO recommendation.14 The percentage of children with these minimal amounts of astigmatism and anisometropia ranged from 62.4% to 64.0% across the six screening scenarios. In contrast, when criteria for RMS were expanded to astigmatism ≤1.25 D and anisometropia ≤1.50 D, the percentage of children within these bounds ranged from 85.8% to 87.4%. If RMS could include the possibility of a spherical power for the fellow eye different from that for the better seeing eye, then the amount of anisometropia would not be important, and the percentage of children that could be accommodated with RMS would range from 79.5% to 90.0% depending on astigmatism limits. To our knowledge, this was the first study to investigate the potential of RMS in meeting the need for refractive correction in visually impaired Chinese schoolchildren under different criteria of anisometropia and astigmatism. In our study population, upward of two-thirds of children in need of refractive correction could be accommodated with single-sphere RMS. High prevalence of URE among children has been reported both in low/middle-income countries and developed countries.20 The advantages of providing RMS to alleviate URE among children include both financial and practical reasons. Good-quality RMS are substantially cheap (US$0.50 per pair of spectacles)8 when purchased in volume and RMS can be provided at the time of refraction, thereby reducing distribution costs. Nevertheless, because RMS prescription is typically based on the eye with lower refractive error, the fellow eye may be undercorrected and have slightly worse visual acuity. Another downside of RMS is that children with astigmatism are not given cylindrical correction. Although two randomised controlled trials conducted in India9 and China10 found statistically significant differences in corrected visual acuity between groups receiving customised spectacles versus RMS, most of these differences only affected one eye and accounted for less than one line of Snellen acuity. Moreover, differences in corrected visual acuity between the customised spectacles and RMS groups did not translate into differences in acceptability or values in terms of visual function, patient satisfaction or continued use. For the majority of children, RMS should be able to meet refractive needs. However, some studies have speculated above certain limits of anisometropia (0.50–2.00 D) or astigmatism (0.75–1.25 D), spherical correction with RMS is no longer appropriate.11–13 Previous studies have found that 66%–89% of adults needing refractive correction could be accommodated with single-sphere RMS.11–13 Our study instead explored the potential of RMS among visually impaired schoolchildren in need of refractive correction. Instead of using an arbitrary definition of suitable candidates for RMS, we explored the feasibility of RMS under six scenarios combining different levels of astigmatism (0.75–1.25 D) and anisometropia (0.50–1.50 D).9–14 Although one prior study found a negative linear relationship between degrees of astigmatism or anisometropia and RMS satisfaction,9 the extent to which anisometropia and astigmatism are tolerated varied considerably among individuals.15 Based on this, we concluded that completely excluding children according to arbitrary anisometropia or astigmatism cut-offs may remove potential beneficiaries of RMS. Since school-based screenings and provision of spectacles are key global strategies to reduce avoidable blindness and visual impairment,7 our main finding has important implications for planners of public health programmes in that more than two-thirds of visually impaired Chinese schoolchildren in need of refractive correction could potentially benefit from RMS. We recommend four steps for school-based programmes to implement RMS. First, visual acuity and refraction screening should identify children who could benefit from spectacles provision. Second, RMS should be obtained, either from local or external mass production or donations. Third, RMS should be initially trialled on all children in need of refractive correction, from which children themselves could help decide if upgrading to customised spectacles is worthwhile. Finally, regular follow-up care should be implemented, including spectacles repair and additional dispensing. All of these steps could be realised by paramedical staff with basic training in subjective refraction. Our analysis may also be of practical application in other communities, especially in countries and sites with high rates of refractive error and where eye care services may be limited. The efficacy of RMS depends on the characteristics of the population requiring refractive correction. Consistent evidence has showed that URE is the leading cause of visual impairment among schoolchildren.14–16 19 Furthermore, multicountry studies have revealed relatively low prevalence rates for astigmatism and anisometropia, with only 13.3% of 5–15 year-old children having astigmatism ≥0.75 D in magnitude and 6% of 6–18 year-old children having anisometropia ≥1.00 D,21 implying the potential of RMS to be used in other settings. The advantages of our analysis include large sample sizes and high response rates. However, some of our results should be interpreted with cautions. As our study was cross-sectional in design and used data sets collected almost 20 years ago, it is possible that the rates of astigmatism and anisometropia that we calculated may not fully reflect current trends. Nonetheless, a recent meta-analysis showed that prevalence rates for astigmatism and anisometropia have remained low and relatively constant over time.22 Additionally, although the Shunyi and Guangzhou surveys were population-based, a school-based sampling strategy was used in Yangxi County, and therefore the Yangxi survey may not be fully representative of the entire county population. However, the aim of our study is to theoretically show the effectiveness of RMS for refractive correction using this large test sample. We do not aim at advocating to use RMS in developed areas where majority of children have already had customised spectacles, such as Guangzhou. Furthermore, given the strong association between myopia and socioeconomic factors (eg, education level), myopia is more prevalent in those with a privilege socioeconomic background, who are more likely to have access to the refractive correction. Nevertheless, our results provide insights of the potential efficiency of RMS in meeting the need for refractive correction in visually impaired schoolchildren, which could be useful in low-resource areas with poor access to optometric services and prescription spectacles. In summary, RMS could substantially alleviate visual morbidity in two-thirds or more of visually impaired schoolchildren in need of corrective spectacles. Incorporating RMS into vision screening programmes and optometry services may enable us to realistically achieve the goal of the WHO’s Vision 2020 initiative, especially in low-resource areas. World Health Organization, 2016. Visual impairment and blindness (2014). http://www.who.int/mediacentre/factsheets/fs282/en/ (accessed 3 Feb 2016).
. Prevalences of astigmatism and anisometropia in adult danes. With reference to presbyopes’ possible use of supermarket standard glasses. Acta Ophthalmol 1984;62:391–400. WHO. Elimination of avoidable visual disability due to refractive errors. Report of an informal planning meeting. Prevention of Blindness and Deafness. Geneva, 2000.
. Occurrence of anisometropia among students ranging from 6 to 18 years of age. Klin Oczna 2005;107:297–9. Contributors Conception and design (JZ, MH); data collection (JZ, MH); analysis and interpretation (ZZ, LBE, SKW, JZ, MH); writing of the article (ZZ, LBE); critical revision of the article (SKW, JZ, MH). Funding The present work was supported by the World Health Organization under National Institutes of Health contract N01-EY-2103, the Fundamental Research Funds of the State Key Laboratory in Ophthalmology, and the National Natural Science Foundation of China (81125007). MH receives support from the University of Melbourne at Research Accelerator Program and the CERA Foundation. The Centre for Eye Research Australia receives Operational Infrastructure Support from the Victorian State Government. Disclaimer The sponsor or funding organisation had no role in the design or conduct of this research. Ethics approval WHO Secretariat Committee on Research Involving Human Subjects.